Imagine my confusion when the kid who used to eat raw kale for a snack suddenly started refusing vegetables altogether. I know it’s pretty normal for toddlers to go through a picky phase, but it was still a bit odd to see Ethan start pushing green beans away, tossing lima beans off of his tray, and cry if he so much as caught a glimpse of spinach. Our pediatrician told us not to worry too much, since he is still great about eating fruit and gets plenty of protein and calcium. However, I still wanted to encourage vegetables however I could, in hopes of this phase passing as quickly as possible. Some people feel that “sneaking” vegetables into food isn’t a great way to encourage kids to eat their vegetables, but it’s hard to deny that it usually works. Ethan could have eaten his weight in grilled cheese that had mashed avocado on it – with some ridiculously finely-minced spinach mixed into it that was barely visible. One of his favorite foods, pierogies, can easily be made with sweet potatoes instead of regular white ones, amping up the nutritional value quite a bit. It may be a little dishonest, but you know what? My kid is eating vegetables. Win. I wanted to find another way to get some veggies into my son in a way that he would enjoy, so I sought out some cookie recipes. I found one on Pinterest that called for two ripe bananas and one cup of quick oats – and that’s it! You just mash it all together, spoon onto a greased baking sheet, pop them into the oven at 350 for 15 minutes, and you’re good to go. Knowing that Ethan approves of all things banana, I made a batch to see how he liked them. They lasted about 36 hours before he had gobbled up every last one! Since that first batch, I have probably made these a dozen times. Each time, I try to add more and more vegetables, to see how far I can go before Ethan turns his nose up. The following recipe has been the most successful! 1. 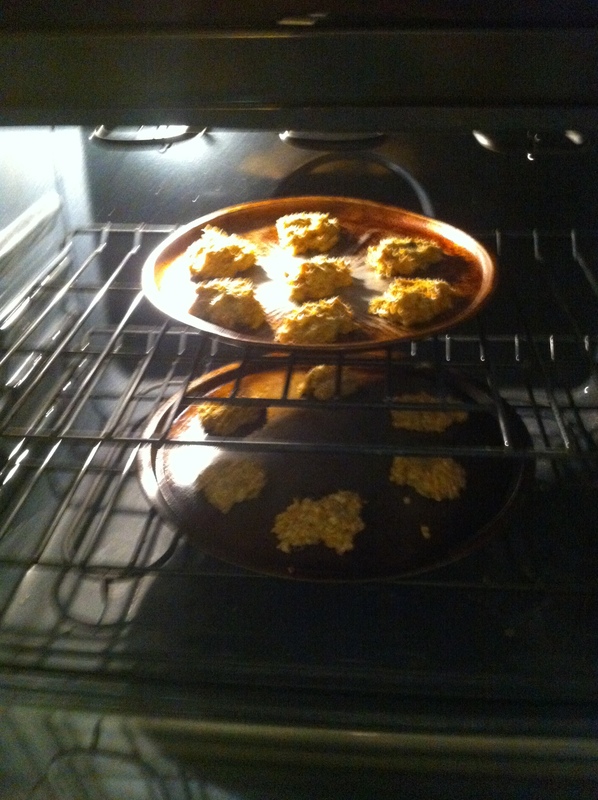 Preheat oven to 350 and grease a cookie sheet, then get your ingredients ready to rock. 2. 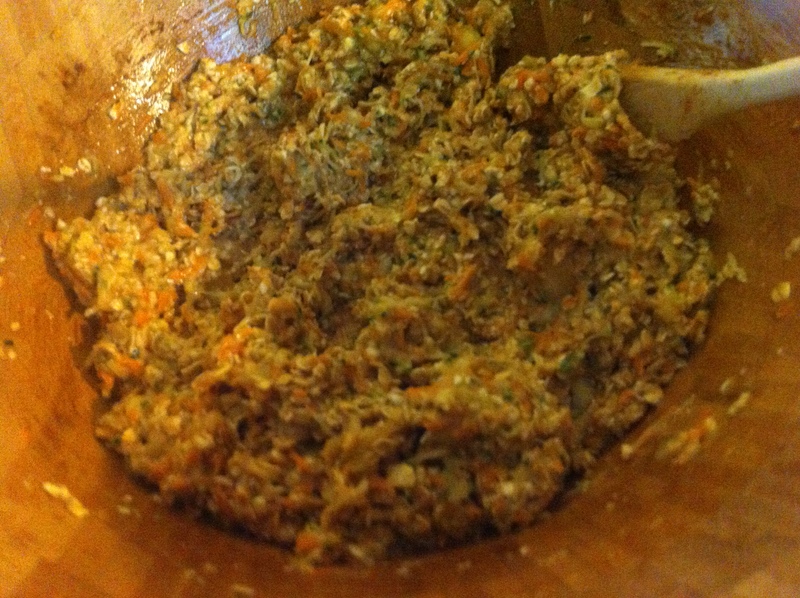 Using a potato masher, mix the oats, bananas, carrot, and zucchini in a bowl. If the mixture seems too wet, add a little more of the oats. 3. Add cinnamon and ginger to taste, then just a little dash of vanilla and a bit of agave or honey to sweeten the mixture (the bananas are usually sweet enough to keep you from needing much). 4. Spoon onto cookie sheet and bake for 15 minutes. The best thing about these cookies is that there are endless variations. I have made them for myself by using pumpkin puree instead of carrot and zucchini, then adding pumpkin pie spice, walnuts, and dried cranberries to the mix, making a wonderful autumn treat. To make them more of a dessert, add a dash of cocoa, a large spoonful of peanut butter, and some chocolate chips! My personal favorite version, though, was the “tropical” version: adding pineapple tidbits, sweetened coconut flakes, and some white chocolate chips. Absolutely delicious! They are a nice alternative to super-sugary desserts, but are still really satisfying. Try making a batch of the sneaky veggie cookies for your child and let me know how they like them! I’m always looking for new versions to try! Wow!! Love love love it!!!! I am SO doing this!! We have bananas turning brown and a crisper full of fresh CSA carrots and zucchini – perfect!! PS: I also have been sneaking purees into every pancake, potato, grilled cheese, meatball and chicken nugget my child had eaten this past year using the Deceptively Delicious cookbook by Seinfeld. 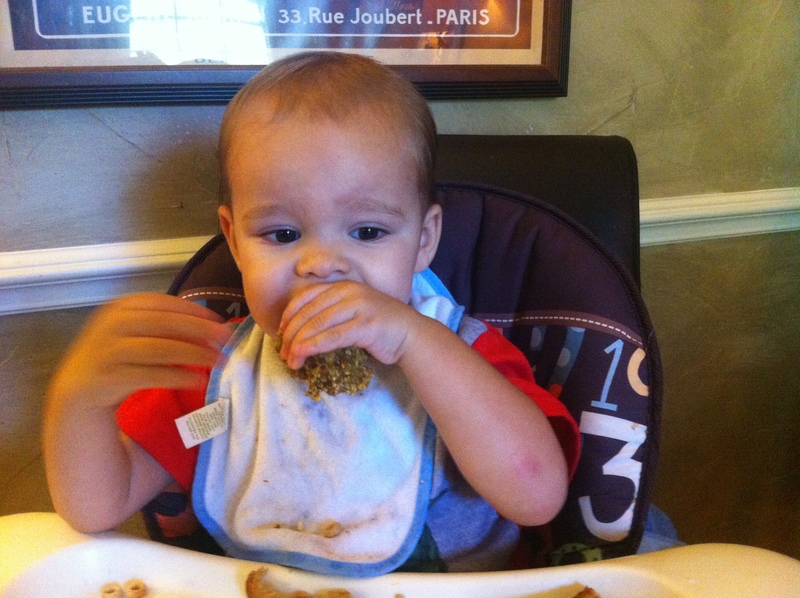 I still present steamed broccoli and carrots on every plate my son gets, but he usually nibbles it and spits it out… Either way I am determined to get veggies in this boy! We still try to offer veggies at most meals as well in hopes that he’ll suddenly start wolfing them down again. Worth a shot! I’ve heard great things about that cookbook. I’ll have to check it out! Yeah, so far no wolfing down here either, but we can dream right?!? Ha ha! !